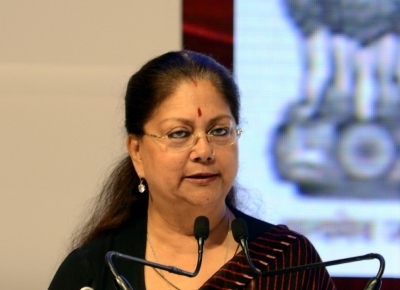 New Delhi, Nov 17 (IANS) The Congress on Saturday released its second list of candidates for the Rajasthan Assembly polls, pitting Manvendra Singh, the son of BJP veteran and former Union Minister Jaswant Singh, against Chief Minister Vasundhara Raje in her traditional Jhalrapatan seat. Former BJP MLA Manvendra Singh, who recently joined the Congress, is among the 32 candidates announced by the party on the day. Jhalrapatan in Jhalawar district has been sending Raje to the Assembly since 2003. The Congress, in its first list of 152 candidates, released on November 16, fielded both its chief ministerial aspirants - Ashok Gehlot and Sachin Pilot. While two-time Chief Minister Gehlot is contesting from his traditional Sardarpura seat, Pilot is in the fray from Tonk. The party has also fielded former Union Ministers C.P. Joshi and Girija Vyas for the Nathdwara and Udaipur Assembly seats.